I've seen similar topics, but none that want exactly what i want. Is there a way to import a video/gif as a background for a map? In the 2k3 version I know you can play short movies or move images, but is there a way to make them the background like that? where the character can walk on the video and such? Sorry if im not making sense, any help will be appreciated! Pretty sure Yume Nikki is just using a basic Parralax Background (one you set in map properties) and setting the scroll speed. 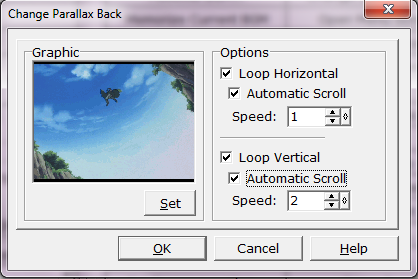 If you're using commercial rm2k3 you can do whatever you want really, in Display Setting of the Show Picture command you can set it to "0: Above Parralax Background" which will display the picture under everything. It's kind of hard to summarize a step after that since it depends on what you're doing from there. O! That makes sense for the picture, i forgot scrolling existed, but then what about videos? :0 is it the same process? There's not much you can do with play movie command, I think everything just freezes until you can continue. It will appear over everything else also. Here's a guide on how to get decent video anyway. But with what you can do with pictures you can actually just convert a small video to a series of images and animate it in any programmable way you want. Here's a large overview of that here. 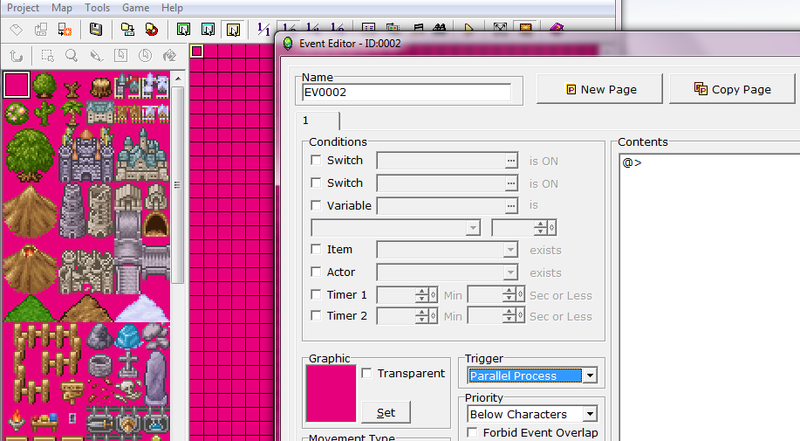 Basically chop all the video frames into a spritesheet, then use the custom sprite sheet settings to animate it. 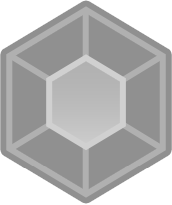 Since you can set its layer you can also have it happen while the player is moving around probably. aw thats a shame :/ thank you though! it was a big help! Now there's actually two ways to do this. The one described in the guide above where you use cherry's new picture-in-battle, and hedge's spritesheet creator to create an animated sprite sheet, that will play inside your game. -Use infranView (or another image program) to covert those series of images to 256 colors so it's compatible with RM2000/RM2003. 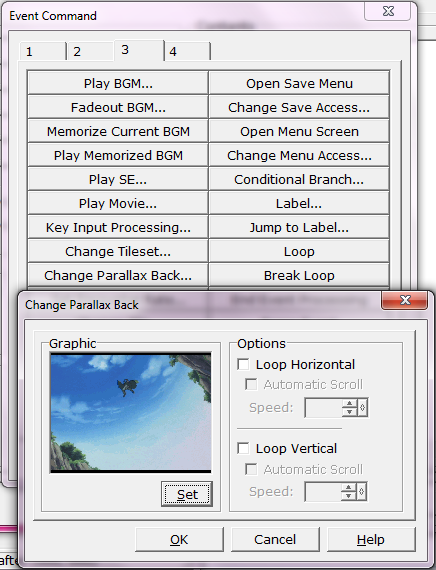 2.Choose Event Command>3>Change Parallax Background. 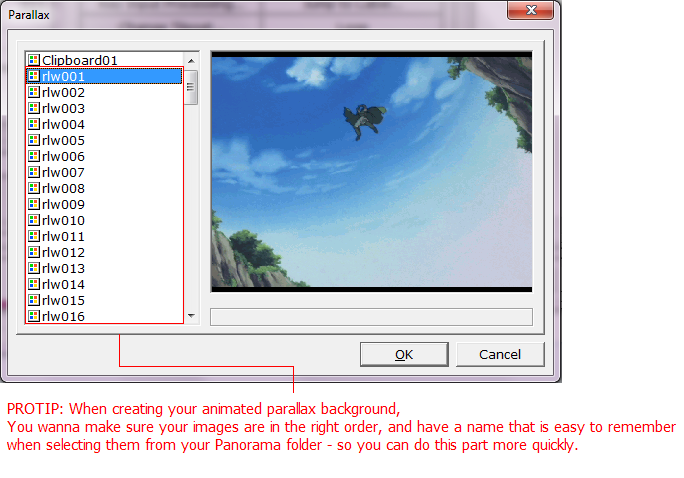 3.Select the first frame of your animated background. so make sure you've decided how you want it to scroll before adding more frames. 6. 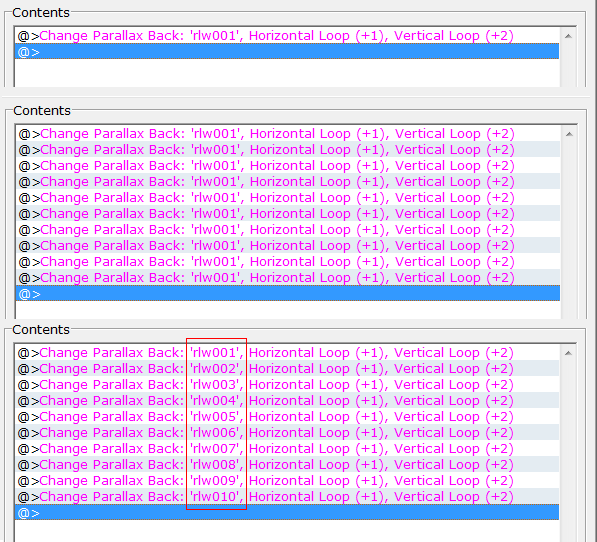 Once you finished inserting all your frames, Create/Copy and Paste a Wait 0.0 command between each frame. Hope this helps puubutt ♥! EDIT: if you have anymore questions let me know. This particular example is 94frames and 12MB - but I need to convert down all the frames to .xyz to help with compression. I knew as soon as I saw this thread that LBR was going to appear with an incredible tutorial, and I am happy to see that I wasn't wrong!